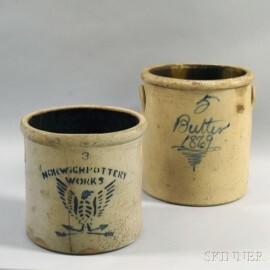 Two Cobalt-decorated Stoneware Crocks, mid to late 19th century, a three-gallon Norwich Pottery Works crock with stenciled eagle decoration, and a five-gallon crock with cobalt lettering reading "Butter 1869," (loss), ht. to 13, dia. to 12 in.